A prime objective of the Cassini orbital mission at Saturn is to characterize the nature and evolution of Saturn's extended family of icy satellites. Cassini observations since the beginning of the prime mission in mid-2004 have made possible the first global maps of these diverse bodies. A team of scientists lead by Dr. Paul Schenk (http://www.lpi.usra.edu/lpi/schenk/) at the Lunar and Planetary Institute in Houston has produced the first global color and topographic maps of these satellites. 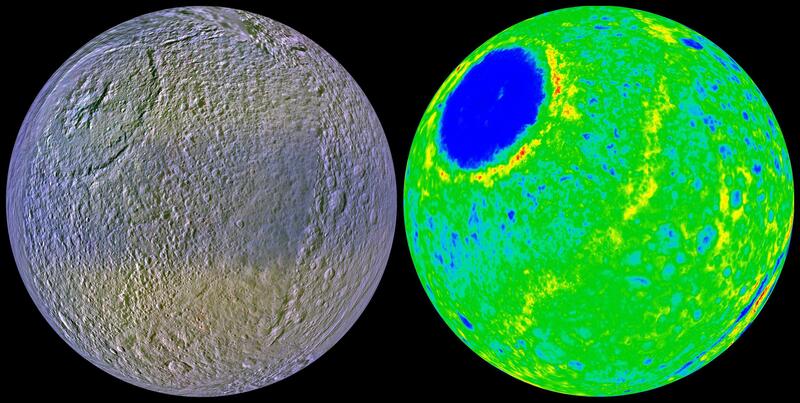 These two views of Tethys show the high-resolution color (at left) and the topography (at right) of the leading, or forward-facing, hemisphere of this 1060-kilometer-diameter (659-mile-diameter) ice-rich satellite. The color map shows the prominent dusky bluish band along the equator, first seen by Voyager in 1980, and shown by Dr. Schenk's team of scientists to be due to the bombardment and alteration of the surface by high energy electrons traveling slower than the satellite's revolution period. These findings were published in the journal Icarus this autumn (Plasma, plumes and rings: Saturn system dynamics as recorded in global color patterns on its midsize icy satellites Paul Schenk, Douglas P. Hamilton, Robert E. Johnson, William B. McKinnon, Chris Paranicas, Jürgen Schmidt and Mark R. Showalter, Icarus, doi:10.1016/j.icarus.2010.08.016). The general reddish tones may be due to the coating of the Tethyean surface by dust-sized particles ejected by Enceladus' south polar plumes. The view at right is a color-coded topographic map of the same region (blues are low, reds are high). The total range of topography shown is 10 kilometers (6 miles) from highest to lowest point. 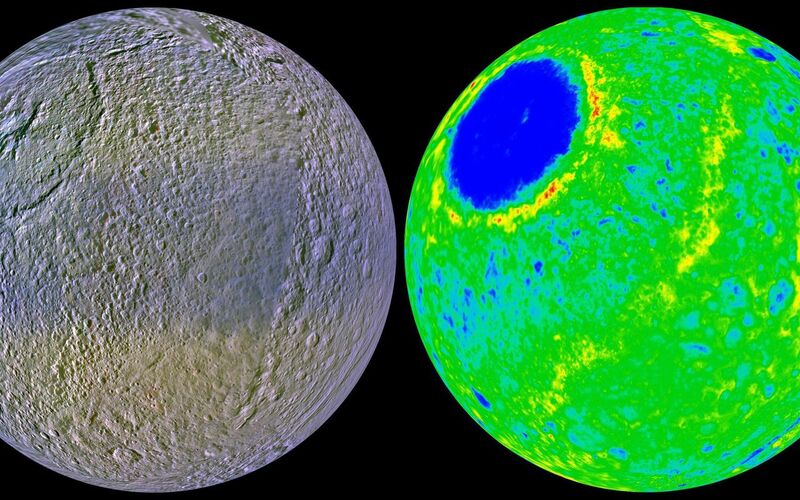 The dominant feature is the 8-kilometer-deep (5-mile-deep) and 440-kilometer-wide (273-mile-deep) Odysseus impact basin at upper left. Straddling the hemisphere like a belt is a previously unknown topographic ridge between 2 and 3 kilometers (1.2 and 1.9 miles) high. To the east of the ridge lies ordinary rolling cratered plains, but between the ridge and Odysseus the surface is scoured and pockmarked. The base resolution of the color map is 400 meters (1312 feet) . The ridge may be a tectonic feature related to the impact event or may be a deposit formed when the ejecta blasted out of Odysseus slammed back onto the surface at high velocity. Visible at bottom right is the globe-circling tectonic canyon, Ithaca Chasma. 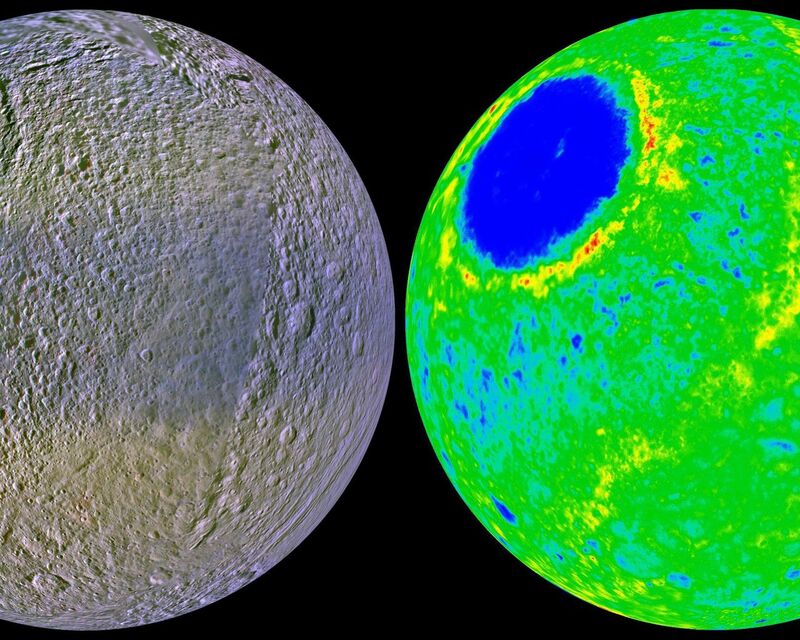 This map is part of a set of new global topographic maps produced by Dr. Schenk's team for each of Saturn's icy satellites and previewed on-line at http://stereomoons.blogspot.com. The raw data from which this product was developed were retrieved from the Planetary Data System's Cassini archives. The Cassini-Huygens mission is a cooperative project of NASA, the European Space Agency and the Italian Space Agency. The Jet Propulsion Laboratory, a division of the California Institute of Technology in Pasadena, manages the mission for NASA's Science Mission Directorate, Washington, D.C. The Cassini orbiter and its two onboard cameras were designed, developed and assembled at JPL. The imaging operations center is based at the Space Science Institute in Boulder, Colo. (http://ciclops.org). Data processing for this image was performed at the Lunar and Planetary Institute in Houston, Texas.